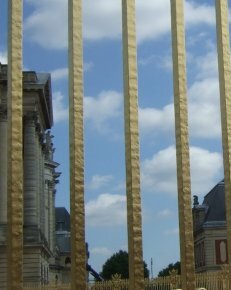 5/7/08 — Heritage — Versailles, Château — The grille which was recently built to link the Dufour et Gabriel Pavillions, on the site where the equestrian statue of Louis XIV commissioned by Louis-Philippe stood formerly, was inaugurated during a presentation to the press corps last Monday. — the ethics of any restoration (and the international conventions signed by France) require that one restitute (when a restitution has been decided upon) the “last known historical state”. And yet, the current state, is obviously not the last known historical state. — more serious still, this is not even a historical state since the Dufour Pavillion (the one on the left when facing the castle) did not exist when Hardouin-Mansart’s work was destroyed. — the design, although it more or less follows that of the original grille, is in every way a modern interpretation by the architect Frédéric Didier ; despite the extensive documentation, no two drawings or engravings are alike. Therefore, every single one of the scrolls and mascarons are interpretations, sometimes after models appearing elsewhere in the castle. — although the grille was funded by a patron (the Monnoyeur group), this considerable sum could have gone towards a more useful project ; it also involves the taxpayer as any donation implies a significant tax deduction. This useless gate is thus very expensive (3.5 million euros). The fact that its execution is not even on a par with its stated purpose is of yet further concern. 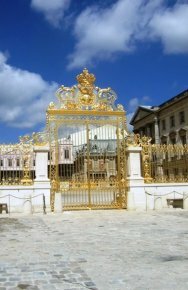 Of course, tourists are sure to be impressed by how brightly it shines, and will fail to appreciate the many authentic grilles throughout Versailles. But the insertion of lights in the stone (for illumination at night), the hammering on the bars (ill. 2) to obtain an “antique look”, and everything else about it exudes an air of being fake and a copy. In light of this, the temporary building (with a stated duration of three years which we hope will not be extended) stuck onto the Dufour wing, totally out of place here, is a relatively lesser evil and we cannot help but be glad that it partially hides the newly inaugurated grille. It is meant to welcome visitors until the remodelling in the Dufour Pavillion and the Grand Commun has been finished… A coffee shop has opened in the southern Ministres wing : the woodwork and minimal interior décor still remaining have been preserved and redone with removable paint ; the furniture is contemporary but understated. Once again, this is meant to be a temporary arrangement, and a rather successful one at that, as these rooms are supposed to eventually house the Musée de l’Histoire de France. Finally, a piece of good news to conclude our article : the statue of Louis XIV will be returning from its “exile” and will be located not too far from its original site, on the Place d’Arme, directly in the château’s axis.